An almond oil conditioning spray helps make your pal's coat healthy and shiny. Almond oil contains nutrients and vitamins to make your dog’s hair strong, soft and extremely shiny. This formula also controls shedding and repels fleas as an added benefit. Almond oil conditioning spray is inexpensive to make, so you can save money for extra dog treats for your buddy. Measure 4 cups of water, and pour it into a pitcher with a lid. Measure 1 teaspoon of pure almond oil and add it to the pitcher. Place the lid on the pitcher firmly. Hold the top of the pitcher in one hand and the bottom in the other hand. Shake the pitcher back and forth vigorously until the oil blends thoroughly into the mixture. Remove the lid from the pitcher and set it aside. Pour the almond oil conditioner into a spray bottle. Bathe your pet as you normally do, using a shampoo that matches his skin and hair type. Make sure to rinse all of the shampoo out of his hair, then towel-dry him. Spray your pal's coat with a light mist of the almond conditioner. Hold one hand over his eyes for protection as you spray him. Brush his coat thoroughly to distribute the almond oil throughout his hair, and let him dry naturally. Shake the conditioner spray bottle to mix the oil into the water before each use. Oil and water will separate, with the less-dense oil floating on top of the water. 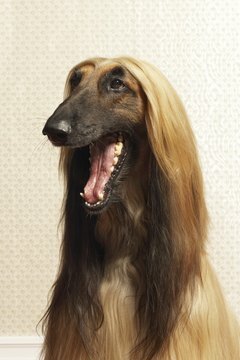 If your pooch has dry skin, part his hair and spray him with the conditioning spray. Massage the spray into his skin to soothe dry, flaky skin irritations. Use almond oil with a label stating “pure” or “essential oil.” Lesser-quality oils do not produce an extremely shiny and lustrous coat. Oils with added ingredients can harm your pet, so avoid them. Is Dog Barking an Instinct or Learned Behavior?